Is this man a nonbeliever? Re: "No Country for Old Men": I'm a bit surprised that nobody has really touched on Chigurh's theology or lack thereof. In the book McCarthy makes clear that Chigurh is a non-believer. This is huge. I believe it's McCarthy's intention to say that Chigurh's atheism carved him into a Darwinian creature with a powerful survivalist function. That's the thing, Chigurh isn't meant as some reaper figure at all. He's an atheist/survivalist, plain and simple. It's not an accident that Chigurh is able to give himself first rate medical care after his leg gets shot up. Nor is McCarthy alluding to some military/medical background. Chigurh has equipped himself to live, he means to live above everything else. Now, remember when he tells Carson Wells -- if the rule you followed led you to this then what good is the rule? This tells us two pretty revealing things about Chigurh. One, that Chigurh is pretty sophisticated and understands that lawmen of all stripe/mode must operate within confined moral/legal spaces. And two, it would appear that Chigurh willfully operates under an evil banner because it's . . . are you ready for this -- safer, i.e. it best serves his strong survivalist function. Many people have labeled "No Country" as one of Cormac's more simple books. But I don't see it that way at all. I see it as a modern classic, a deep meditation on the natural conclusion of atheism (the recklessly craven positioning of self for purposes of survival) and the believers who dare to exist for causes outside of self, an endeavor that "No Country" makes clear is noble indeed but corrosive to the soul. I don't buy this reading (of the novel or the movie or atheism) for several reasons (just keep reading), but I think it provides another way of looking at Chigurh's place in the universe of "No Country." First, Wells is not a lawman of any kind. He's hired by the crooks, after all, and his sole job is to retrieve the money. He knows full well he'll need to kill Chigurh to get it. In the book, the line "If the rule you followed brought you to this, of what use was the rule?" comes after Chigurh tells Wells why he'd let himself get arrested: "I'm not sure why I did this but I think I wanted to see if I could extricate myself by an act of will. Because I believe that one can. That such a thing is possible. But it was a foolish thing to do. A vain thing to do. Do you understand?" In the movie, it comes after Wells challenges Chigurh's "certainty." Chigurh says: "I do know to a certainty. And you know what's going to happen now. You should admit your situation. There would be more dignity in it." In both contexts, Chigurh is simultaneously asserting the primacy of his "principles" (as Wells characterized them earlier) and avoiding responsibility. 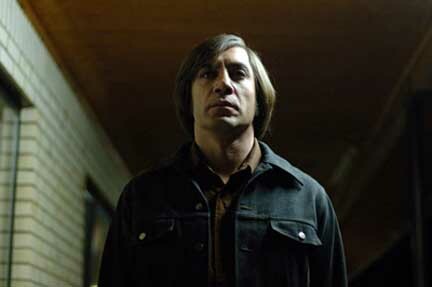 With his victims, Chigurh assumes a passive role. He doesn't make the choice to kill them. They have made choices that have summoned him. He sees himself as an agent of fate -- a fate that others have brought upon themselves. The coin toss makes it pretty explicit that he does not see himself as The Decider. The "nonbeliever" reference (which is in the novel, not the film) comes in Chigurh's conversation with Carla Jean. He claims he gave his word and he can't change it. Carla Jean argues that he has the power to change it if he wants to, but he responds: "I don't think so. Even a nonbeliever might find it useful to model himself after God. Very useful, in fact." Although Carla Jean calls him a "blasphemer" for invoking God in that way, he's not exactly saying he believes God does not exist. "But what's done cannot be undone," he continues. "Your husband, you may be distressed to learn, had the opportunity to remove you from harm's way and he chose not to do so. He was given that option and his answer was no. Otherwise I would not be here." In the movie, Chigurh says, "Your husband had the opportunity to remove you from harm's way. Instead he used you to try to save himself." "Not like that," Carla Jean responds. "Not like you say." "I don't say anything," says Chigurh. "Except it was foreseen." (This echos Carla Jean's mother, whom she has buried that very day: "I pre-visioned it.") Both Wells and Carla Jean respond to Chigurh's "logic" by calling him crazy. And he is. But an "atheist/survivalist"? A "Darwinian creature with a powerful survivalist function"? I don't think so. Chigurh doesn't kill in order to survive. He is, therefore he kills. Just chiseled out of the rock. And I got to thinkin about the man that done that. That country had not had a time of peace much of any length at all that I knew of. I read a little bit of history of it since and I aint sure it ever had one. But this man had set down with a hammer and chisel and carved out a stone water trough to last ten thousand years. Why was that? What was it he had faith in? It wasnt that nothin would change. Which is what you might think, I suppose. He had to know bettern that.... I have to say that the only thing I can think of is that there was some sort of promise in his heart. And I dont have no intentions of carvin a stone water trough. But I would like to be able to make that kind of promise. I think that's what I would like most of all. The way I read this passage, it's strictly existential. The "faith" that man had isn't in God, but in the future of his species right here on this earth.